Named after the Egyptian Queen who adored the golden thin sand at this beach. It is on the west of Alanya. It is almost 2 kilometers long. The beach is wide and the sea is not very deep. It 's 20 km/ away from Alanya, is by the forest. The sand is extremely soft and thin. It has a camping area as well. On the east of Alanya. On Mersin - Alanya highway. In between Mersin and Alanya. There are facilities all along the beach where you can find almost everything. This beach is 6 km. long. It is one of the most preferred beaches in the area. Karayolu (Highway) Ulaş Dinlenme Park is build as a car parking facility. This sea has the ability to clean it self. It is the only sea that has this property. There are 3 natural pools by the beach. These are perfect for those who are rookie at swimming. Located on the east, 12 km. away from Antalya. It is full of pine trees. Has a soft thin sand. The beach is open to public. There are food courts and other necessary facilities all around. The beach is 3 km. away from the city center of Antalya. The length of the beach is 1.5 km. It has mixture of sand and small rocks. There are lots of facilities around, including hotels and bars. Is a nice beach and some part of the beach has thin/golden sand. One of the most beautiful beaches in the area. There is an historical site which is very close to the beach. Patara beach is a preserved site. It is not very close to the city, however those who are looking for an adventure might plan a small trip and visit this lovely beach. It has a wild natural beauty where the sand covers the beach and in some parts huge rocks fills the view. With its nice view, being on the thin sand sounds like a gate to heaven. There is a natural port where some of the daily sea tours stop by during the day. It can be named as the most beautiful beach of the area. It is on the way to Manavgat, you need to catch the way to the North and go 6km till you reach the beach. 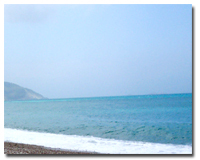 It is a small, natural beach, also a beach where you can find a private area as well. It is on the west of Lara Beach. The Water fall Duden, cascades the sea by this beach. The area is also used as a military camping site. The sand is very thin and the sea is not very deep. The rocky beach has facilities all around.